A wide-ranging new study of fossils spanning over four million years suggests that stature and body mass advanced at different speeds during the evolution of hominins - the ancestral lineage of which Homo sapiens alone still exist. Published today in the journal Royal Society Open Science, the research also shows that, rather than steadily increasing in size, hominin bodies evolved in "pulse and stasis" fluctuations, with some lineages even shrinking. While researchers describe the physical evolution of assorted hominin species as a "long and winding road with many branches and dead ends", they say that broad patterns in the data suggest bursts of growth at key stages, followed by plateaus where little changed for many millennia. The scientists were surprised to find a "decoupling" of bulk and stature around one and a half million years ago, when hominins grew roughly 10cm taller but would not consistently gain any heft for a further million years, with an average increase of 10-15kgs occurring around 500,000 years ago. Before this event, height and weight in hominin species appeared to evolve roughly "in concert", say the authors of this first study to jointly analyse both aspects of body size over millions of years. "An increase solely in stature would have created a leaner physique, with long legs and narrow hips and shoulders. 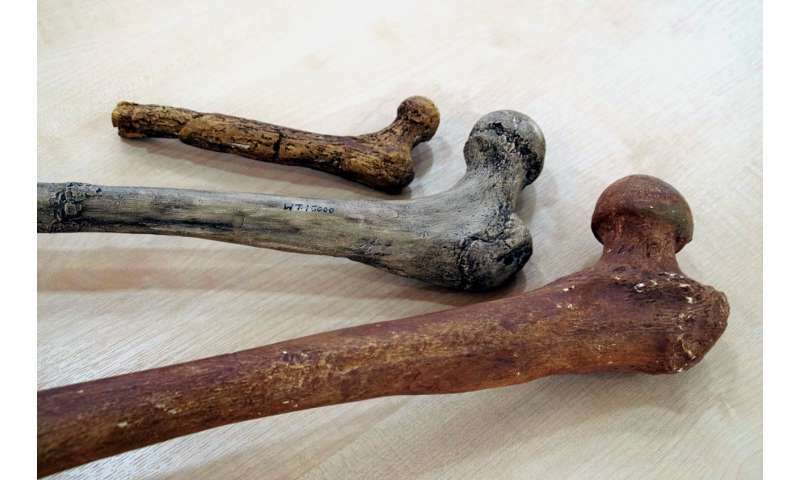 This may have been an adaptation to new environments and endurance hunting, as early Homo species left the forests and moved on to more arid African savannahs," says lead author Dr Manuel Will from Cambridge's Department of Archaeology, and a Research Fellow at Gonville and Caius College. "The higher surface-to-volume ratio of a tall, slender body would be an advantage when stalking animals for hours in the dry heat, as a larger skin area increases the capacity for the evaporation of sweat." "The later addition of body mass coincides with ever-increasing migrations into higher latitudes, where a bulkier body would be better suited for thermoregulation in colder Eurasian climates," he says. However, Dr Will points out that, while these are valid theories, vast gaps in the fossil record continue to mask absolute truths. In fact, Will and colleagues often had to estimate body sizes from highly fragmented remains - in some cases from just a single toe bone. The study found body size to be highly variable during earlier hominin history, with a range of differently shaped species: from broad, gorilla-like Paranthropus to the more wiry or 'gracile' Australopithecus afarensis. Hominins from four million years ago weighed a rough average of 25kg and stood at 125-130cm. As physicality morphs over deep time, increasingly converging on larger body sizes, the scientists observe three key "pulses" of significant change. Stature then separated from heft with a height increase alone of 10cm between 1.4-1.6m years ago, shortly after the emergence of Homo erectus. "From a modern perspective this is where we see a familiar stature reached and maintained. Body mass, however, is still some way off," explains Will. It's not until a million years later (0.5-0.4m years ago) that consistently heavier hominins appear in the fossil record, with an estimated 10-15kg greater body mass signalling adaptation to environments north of the Mediterranean. "From then onwards, average body height and weight stays more or less the same in the hominin lineage, leading ultimately to ourselves," says Will. "They may have derived from much older small-bodied ancestors, or adapted to evolutionary pressures occurring in small and isolated populations," says Will. Floresiensis was discovered on an Indonesian island. "Our study shows that, other than these two species, hominins that appear after 1.4m years ago are all larger than 140cm and 40kg. This doesn't change until human bodies diversify again in just the last few thousand years." "These findings suggest extremely strong selective pressures against small body sizes which shifted the evolutionary spectrum towards the larger bodies we have today." Will and colleagues say evolutionary pressures that may have contributed include 'cladogenesis': the splitting of a lineage, with one line - the smaller-bodied one, in this case - becoming extinct, perhaps as a result of inter-species competition. They also suggest that sexual dimorphism - the physical distinction between genders, with females typically smaller in mammals - was more prevalent in early hominin species but then steadily ironed out by evolution. Study co-author Dr Jay Stock, also from Cambridge's Department of Archaeology, suggests this growth trajectory may continue. "Many human groups have continued to get taller over just the past century. With improved nutrition and healthcare, average statures will likely continue to rise in the near future. However, there is certainly a ceiling set by our genes, which define our maximum potential for growth," Stock says. "Body size is one of the most important determinants of the biology of every organism on the planet," adds Will. "Reconstructing the evolutionary history of body size has the potential to provide us with insights into the development of locomotion, brain complexity, feeding strategies, even social life."